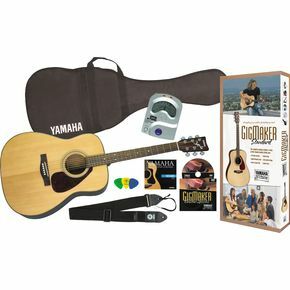 The Yamaha GigMaker Acoustic Guitar Pack is a good first step if you’re looking to learn the acoustic guitar. Not only does it come with a good sounding guitar, but everything you need to get started as a guitarist. If you had to purchase everything separately you would pay a good bit more than the ~$159 price tag that is on the Yamaha GigMaker Pack. The all-laminate guitar alone is worth the price. But you not only get the guitar, but a gig bag, a guitar strap, extra strings, a digital tuner, picks and a DVD that will provide you with step-by-step playing instructions. While the guitar that comes in the GigMaker Pack is a good sounding guitar and fairly easy to play, there are a few issues with the construction of the guitar and the items that come with it. Being made all of laminates, the guitar does not hold its tuning well. The particular laminate on this guitar is also not the best quality; it tends to chip easily and the bridge laminate tends to start peeling relative quickly. There is also the issue of the second hook for the guitar strap; there is none! While it is fairly simple to add a second hook, it’s the moral of the story; they shouldn’t sell it with a guitar strap if there is no way to attach the guitar strap to your guitar. On the bright side, the tone of the guitar does tend to get better the longer you play it. While the need for tuning does not abate, the tone of this guitar gets fuller after a few years of use; if there is enough of the guitar left to play after you’ve had it that long. While this is a good guitar for beginners for this price, it is advisable to look for a solid top guitar, such as the Epiphone AJ-220ST Solid Top Acoustic Guitar Pack. For just ~$40 more dollars, you’ll save yourself having to get a new guitar after a few years of playing. Check out the strap. These straps commonly have one 'button-hole' end and one end with ties. Fit the button in the hole. Now take the ties and pass ONE of them DOWMWARDS under the strings UPSTREAM FROM THE NUT. Put the other tie under the neck and tie them together SECURELY. That's how these things fit. Be aware of the fact that this stresses the neck whenever you use it. Better still, buy a good guitar. This pack arrived at my house with rusty strings, sounding SO BAD I couldn't wait to get rid of it. How could Yamaha make such a terrible instrument? Yamaha FG700S Folk . Amazing guitar for the money!! Same price, $199 but without the case and the accessories. Worthwhile trade-off! !